​SHARK TEAM ONE Fine Art Jewelry! Each time we go out on expedition to see the amazing animals we work to save, we can't help but miss them the moment we come back home. Now you can own a fine art jewelry commemorative expedition piece handcrafted by Studios of Harry W. Smith with design collaboration by Shark Team One's founder, Angela Smith. Harry Smith's gorgeous designs are inspired by nature and created in his studio overlooking Penobscot Bay on the coast of Maine. His love and respect for the world's wildlife is reflected in each signature piece. Shark Team One founder, Angela Smith was proud to collaborate with Harry on the concept for this magnificent endangered whale shark pendant. Words can't describe the stunning beauty of this precious metal whale shark donated to Shark Team One to help save what is left of our oceans' dwindling whale shark populations! 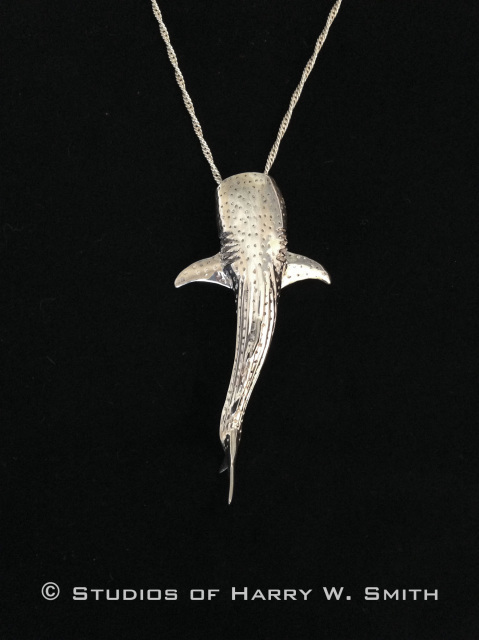 This stunning handcrafted whale shark pendant is 2.25" long. The chain is 24" long and the shark is completely three-dimensional. Both shark pendant and chain are made of solid sterling silver. The pendant has beautiful full detail of a graceful and charismatic endangered whale shark. This piece was designed for Shark Team One by Harry Smith of Studios of Harry W. Smith, who has kindly donated this piece. It's proceeds will assist our conservation work off the Yucatan Peninsula where we carry out conservation expeditions each summer. ABOUT STUDIOS OF HARRY W. SMITH: Harry W. Smith's jewelry, collectibles and fine art have graced worldwide galleries, museums and reside in the homes of celebrities. Harry has been compared to Fabergé for his detailed work in precious metals and been called a renaissance man for his miniature work such as his exact replica of Louis XIV study in the Palace of Versailles. We are proud to share Harry’s love of art, travel, and nature! ​To contact Division of Consumer Services: 1-800-HELP-FLA (435-7352) or visit www.FloridaConsumerHelp.com.